One, count 'em, ONE more week of picking up produce from our CSA. I demand someone tell me what happened to the summer? This will also be the last week of our farm demo's which I have been a part of, and I have been working on some squash recipes for the final day. I cooked up a giant squash from last week's pick-up and put 4 cups of the cooked flesh in a soup pot. I added a whole can of coconut milk, 1 teaspoon of red curry paste, about 1 teaspoon curry powder, a bit of chicken stock to thin, and lots of salt and pepper. Pureed with my stick blender. Topped with just a sprinkle of cilantro and it's a winner! Lots of autumn veggies at the farm now, and I had a huge head of beautiful white cauliflower that needed to be cooked. 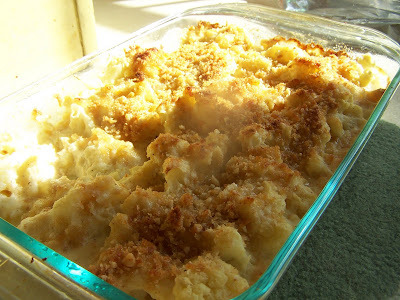 I've long been a fan of Ina Garten for years, and found this recipe to be just the ticket for a most delicious gratin. It will be our side dish this afternoon to some marinated, grilled steaks. Hospice is coming 2x a week for now. Alex is being fed thru a permanent feed tube he had inserted last week and is doing as well as can be expected. His lungs are clear and his vitals are good. He is still smiling, but can no longer cry or make any noise. You know he is upset when his little face is scrunched up and the tears are falling. We appreciate all the prayers on our behalf and please know that they truly do help. Your recipes sound very good. Continue to pray for all of you. It is only by the grace of God a person can go through these trials. Your quote was so good, none of us know if it is our last day on earth. Sending my prayers and hugs. 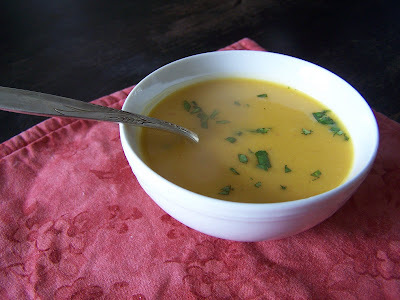 I LOVE squash...and that soup looks really tasty...and so does the au gratin, too. Thank you so much for the update on Baby Alex....Thank you for being willing ot share so mething so personal, too...I"m honored to be able to pray for this precious little guy :) :) I'm glad he can still smile!!!! Much thoughts and prayers for all , what a precious photo. May God's grace continue to surround you and your family! Lifting up little Alex and his sweet family - how HARD this must be for all those that love him! Your cauliflower recipe looks great, Cyn - will have to try that one! Thank you for the Update..As I have been thinking and praying for Alex these last few days...as I have been sick with the Flu..I thought often of him and cried..as I was feeling miserable..with congestion, coughing and sore throat..then when my baby began to show signs and ended up coming down with it as well..I couldn't help but think about Alex..I knew that ultimatley I would see the end of this and wake up feeling better one day...and of course I couldn't help but for my heart to hurt and cry for Alex..Thank The Lord Alex has such a loving and Caring family to surrond him and comfort him when he is hurting..May the Lord continue to give his parents strength..especialy Mamma..as I am sure her heart is being tested and tried during this time..
Our Prayers are with you and his at this time.. Still praying for sweet Alex! Cindy, I was just reading about little Alex. It takes my breath away... I will keep him, you and your family in my prayers. Continuing to think of you all and remember you before the Throne of Grace. One day at a time...WITH the LORD! May HE daily give you all the grace and strength you need and may you enjoy these precious days with your little Alex. Sending you a big hug from Canada! Just doing a little crying and praying for you all. Sometimes all we can do is wait and trust and praise that all our hopes are met and filled in Him. I was studying the book of Daniel tonight and was reminded that sometimes we are thrown into the fiery furnace...but that God meets us in the flames. My father would love the cauliflower recipe...I'll have to save that in my recipe file. Oh my dear sweet friend~ I am praying for you all. My very dear friend went through this with her baby Kristen~ she had only a three chambered heart, no liver or spleen. Kristen has been in Heaven with Jesus now for 24 years. She is the same age as my Ashley. I feel your pain so deeply. My heart breaks for you all but I know God's grace will be there each step of the way. I am lifting your sweet Alex up daily in my prayers. still praying in LA. Honestly, when I look at this picture of your family with little Alex, my heart breaks. I wish I had a magic wand, I want it to be different. I lost a baby a few years ago and initially, all I wanted to know was WHY! Eventually, I realized that there would be no satisfactory answer to that question. But I still am tempted to ask God WHY! on your behalf. And I still realize that there will be no satisfactory answer for the question. But you really can't help but ask it. The baby is sooooo prescious and I just wish I could change this for you and for anybody going through challenges like these. Your family is amazing and I will continue to pray for you all. When I meet with God every morning before going to the barn Alex is in my prayers. As a Gammie it breaks my heart but we can do this with prayer together!